Manchester United maintained the pressure on Manchester City at the Premier League summit with a comfortable win against Queens Park Rangers at Loftus Road. Wayne Rooney set them on the way to a victory that restored them to the top of the table - if only for a few hours - with a header inside the first minute. And after United missed a succession of chances and were denied by QPR keeper Radek Cerny, Michael Carrick settled an entertaining encounter and gave them the winning margin their vast superiority deserved with his first goal in 70 games for United, shortly after half-time. 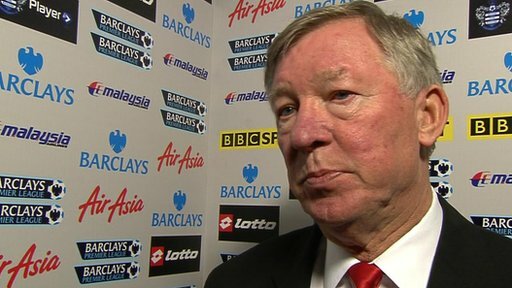 QPR were tenacious but were eventually outclassed by United's greater quality, as Sir Alex Ferguson's side continued their rehabilitation from their shock Champions League exit with a second successive league win to maintain their pursuit of a 20th title. With Darren Fletcher ruled out for the foreseeable future through illness, Carrick was paired with Phil Jones in central midfield. And the versatile England teenager could also have got on the scoresheet in a powerful and impressive performance, hitting the woodwork and being halted by Cerny after a surging run. United still showed occasional signs of frailty in defence without injured captain Nemanja Vidic and with Patrice Evra particularly vulnerable, but they ultimately carried far too much power for QPR, especially with Rooney restored to his familiar attacking role after a spell in midfield. 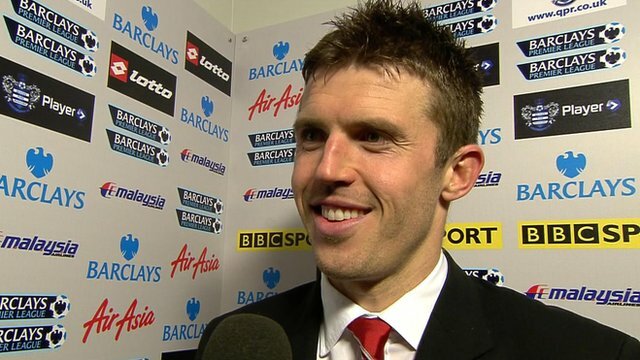 Michael Carrick's goal was only his third away from home. The visitors were unchanged from the win against Wolves - but had the lift of the early return of Javier Hernandez on the bench after suffering an ankle injury in the recent win at Aston Villa. It was Rooney who made the instant impact as he stole in on Antonio Valencia's cross to send a downward header beyond the reach of Cerny in the opening seconds to subdue a typically vibrant atmosphere inside Loftus Road. United's slick passing was proving too much for QPR in the early exchanges and Cerny needed to dash off his line to block Danny Welbeck after he was played in by Nani. QPR, however, showed real reserves of resilience to dig their way back into a match that looked well beyond them at the start, with striker Heidar Helguson taking advantage of weakness in United's defence as he headed Joey Barton's cross just over. For all the typical endeavour of Warnock's side, it was United who showed thrust going forward as they created a succession of chances before the interval. Jonny Evans headed on to the bar from a corner, while Cerny saved QPR again after 28 minutes when he dived at the feet of Jones after Rooney's incisive pass sent him racing clear. Cerny, heroic in QPR's defeat at Liverpool last week, was in outstanding form again as he demonstrated agility and sharp reflexes to save from Valencia as he looked certain to add United's second. QPR refused to go under in the face of United's attacking threat and created opportunities of their own as the interval approached. United keeper David de Gea blocked Helguson's shot with his legs before Jay Bothroyd's low cross flew agonisingly beyond the stretching Jamie Mackie. United were in no mood to let any more chances slip away - and they duly punished QPR nine minutes after the break, with more than a little help from the Londoners. Carrick dispossessed Barton with ease and advanced unchallenged towards the area before scoring with a low shot that Cerny should have made a better attempt to keep out. It was a rare, albeit vital, blemish on Cerny's performance and he was soon distinguishing himself again with a spectacular save from Welbeck, who was promptly removed and replaced by Hernandez. QPR, understandably, were showing signs of deflation and Jones almost increased their lead further only to strike a post, before Cerny was the barrier once more to save from Nani. Adel Taarabt and DJ Campbell were introduced in a double change by Warnock as time ran out and created their side's best chance of the game. Taarabt's cross should have been converted by the striker, who somehow put his effort off target from right in front of goal. It was United's final moment of anxiety - and with the door left ajar in the title race by Manchester City's first defeat of the season at Chelsea on Monday, United will be delighted with another important victory. 90:00+3:05 The match has reached full-time. 90:00+2:22 Effort on goal by Javier Hernandez from outside the penalty box goes harmlessly over the bar. 90:00+1:35 Ashley Young takes a shot. Save by Radek Cerny. 90:00+0:34 Free kick awarded for a foul by Patrice Evra on Jamie Mackie. Joey Barton delivers the ball from the free kick right-footed from right wing. 88:30 Shot by Clint Hill. Save made by David De Gea. 88:09 Chris Smalling handles the ball and concedes a free kick. Free kick taken by Matthew Connolly. 87:26 Substitution Ashley Young on for Luis Nani. 86:17 Headed effort from inside the penalty area by Javier Hernandez misses to the right of the target. 84:18 Ryan Giggs decides to take the corner short. 83:32 The assistant referee flags for offside against Adel Taarabt. David De Gea takes the indirect free kick. Correction - 80:05 Joey Barton gives away a free kick for an unfair challenge on Patrice Evra. Free kick crossed left-footed by Ryan Giggs from left channel, Daniel Gabbidon manages to make a clearance. 80:05 Joey Barton gives away a free kick for an unfair challenge on Patrice Evra. Ryan Giggs takes the direct free kick. 76:49 Michael Carrick takes the direct free kick. 76:49 Substitution Wayne Rooney goes off and Ryan Giggs comes on. 76:49 Armand Traore gives away a free kick for an unfair challenge on Jonathan Evans. 76:05 Outswinging corner taken by Luis Nani from the right by-line played to the near post, clearance by Alejandro Faurlin. 74:28 Substitution Clint Hill comes on in place of Jay Bothroyd. 74:09 DJ Campbell takes a shot from inside the six-yard box clearing the crossbar. 72:13 Javier Hernandez is flagged offside by the assistant referee. Free kick taken by Radek Cerny. Correction - 70:51 Foul by Jay Bothroyd on Michael Carrick, free kick awarded. Direct free kick taken by Jonathan Evans. 70:51 Free kick awarded for a foul by Jay Bothroyd on Michael Carrick. Free kick taken by Jonathan Evans. 68:20 Phil Jones has an effort at goal from the just inside the box hitting the post. 67:29 Outswinging corner taken by Joey Barton from the right by-line played to the near post, save by David De Gea. 65:32 Free kick awarded for a foul by Javier Hernandez on Matthew Connolly. Radek Cerny takes the direct free kick. 64:29 Free kick taken by David De Gea. 64:29 Substitution DJ Campbell joins the action as a substitute, replacing Heidar Helguson. 64:29 Substitution Adel Taarabt joins the action as a substitute, replacing Shaun Wright-Phillips. 64:29 The assistant referee signals for offside against Heidar Helguson. 62:39 The assistant referee flags for offside against Jonathan Evans. Radek Cerny takes the free kick. 62:04 Luis Nani takes the outswinging corner, clearance by Matthew Connolly. 62:04 Substitution Javier Hernandez comes on in place of Danny Welbeck. 61:36 Danny Welbeck takes a shot. Radek Cerny makes a save. 60:33 Joey Barton takes the free kick. 60:33 Booking Phil Jones booked for unsporting behaviour. 60:24 Foul by Phil Jones on Jay Bothroyd, free kick awarded. 57:40 Luis Nani decides to take the corner short, Effort from close in by Wayne Rooney goes wide left of the target. 55:16 GOAL - Michael Carrick:QPR 0 - 2 Man Utd Michael Carrick fires in a goal from just inside the area to the bottom left corner of the goal. QPR 0-2 Man Utd. 51:29 Jay Bothroyd takes a shot. Blocked by Michael Carrick. 50:27 Michael Carrick is penalised for handball and concedes a free kick. Radek Cerny restarts play with the free kick. 48:26 Shaun Wright-Phillips fouled by Phil Jones, the ref awards a free kick. The free kick is delivered right-footed by Joey Barton from left wing. 48:02 Wayne Rooney takes a shot. Blocked by Daniel Gabbidon. 45:19 Wayne Rooney takes a shot. Save made by Radek Cerny. 44:33 Shaun Wright-Phillips takes a shot. Blocked by Jonathan Evans. 43:40 Corner from the right by-line taken by Joey Barton, clearance made by Chris Smalling. 42:01 Corner from the right by-line taken by Joey Barton, Jonathan Evans makes a clearance. 40:22 Jay Bothroyd gives away a free kick for an unfair challenge on Rio Ferdinand. David De Gea takes the direct free kick. 39:43 Rio Ferdinand concedes a free kick for a foul on Heidar Helguson. Free kick taken by Luke Young. 32:30 Effort from outside the penalty box by Jay Bothroyd goes wide right of the target. 31:49 Effort on goal by Jay Bothroyd from inside the penalty area goes harmlessly over the bar. 31:36 Heidar Helguson takes a shot. David De Gea makes a save. 31:20 Wayne Rooney has an effort at goal from close range which goes wide of the left-hand upright. 30:46 Corner taken right-footed by Luis Nani from the right by-line to the near post, Jonathan Evans takes a shot. Alejandro Faurlin makes a clearance. 30:19 Wayne Rooney takes a shot. Armand Traore gets a block in. Antonio Valencia takes a shot. Save by Radek Cerny. 29:12 Free kick awarded for a foul by Jamie Mackie on Rio Ferdinand. Jonathan Evans takes the free kick. 28:44 Corner taken short by Luis Nani. 28:29 Phil Jones takes a shot. Save by Radek Cerny. 26:49 Luis Nani takes the inswinging corner, Jonathan Evans takes a shot. 25:39 Heidar Helguson produces a left-footed shot from a long way out which goes wide right of the goal. 25:12 Booking Daniel Gabbidon is booked. 23:05 Danny Welbeck is caught offside. Radek Cerny takes the free kick. 22:21 Phil Jones has an effort at goal from just outside the box which goes wide of the left-hand post. 18:20 Patrice Evra gives away a free kick for an unfair challenge on Jay Bothroyd. Joey Barton takes the free kick. 17:37 Booking Rio Ferdinand receives a yellow card. 16:42 Shot by Jay Bothroyd from deep inside the penalty area misses to the right of the goal. 14:16 Corner taken right-footed by Luis Nani from the left by-line to the near post, save by Radek Cerny. Michael Carrick takes a shot. Daniel Gabbidon gets a block in. 8:34 Luis Nani takes a outswinging corner from the right by-line played to the near post, clearance by Jay Bothroyd. 8:04 Luis Nani takes the outswinging corner, clearance made by Jay Bothroyd. 7:05 Corner taken by Joey Barton played to the near post, clearance by Luis Nani. 5:17 Outswinging corner taken right-footed by Joey Barton from the right by-line, Headed effort from deep inside the penalty area by Heidar Helguson misses to the right of the target. 4:26 Shot from just outside the box by Shaun Wright-Phillips goes over the bar. 3:51 Free kick awarded for a foul by Phil Jones on Jay Bothroyd. Free kick taken by Radek Cerny. 2:44 Danny Welbeck takes a shot. Save by Radek Cerny. 0:52 Antonio Valencia provided the assist for the goal. 0:52 GOAL - Wayne Rooney:QPR 0 - 1 Man Utd Wayne Rooney finds the net with a headed goal from close in. 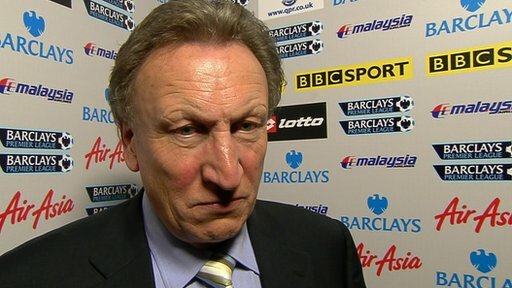 QPR 0-1 Man Utd.